First Demo of RigaJUG agenda. 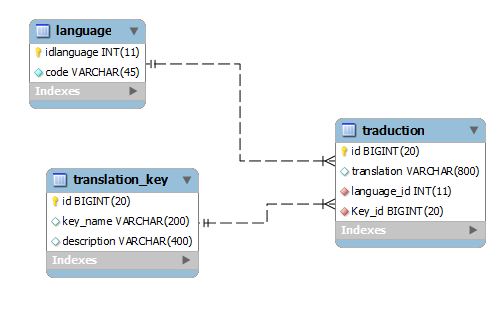 Starting from a simple model that holds translation information. Minuteproject will generate a JPA2 layer. Altering generated code to add JSR 303 (validation) annotation. The generation made by the command line has more enrichment facilities than just working via the console. Example: here the configuration add querydsl integration. The rest of the demo will focus on the configuration enrichment facilities. Ideally the console should move into a IDE plugin manipulating the configuration. DB naming convention used (the foreign key name is composed of the name of the link entity + '_id' is converted into java by provided name stripped from the 'Id' particule. Based on auto increment pk when not natural. 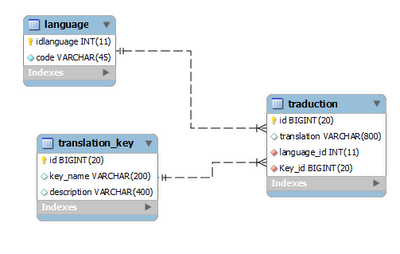 each entity is associated to a metamodel java file to build type safe criteria queries. MinuteProject artefacts are designed to be tested and ready to be deployed! All artefacts have an updatable nature, meaning that you can change the code or add new code and consecutive generation will keep your modifications. The persistence.xml provides a configuration with embedded connection pool. Under the target JPA2 node. Now further generation will keep your added code. The validation scenario has been inspired by this link.